Will Bigger Calves Help Me Run Faster? For competitive runners, small differences in physiology and muscle development can have big effects on the outcome of a race. While a variety of processes helps to determine your running speed, the size and strength of the muscles in your legs are among the most important. Whether you run long distances or sprint competitively, increasing the size of your calves through exercise may help you to run faster. Comparing the calf size of different types of elite runners helps to illustrate the relationship between calf size and running speed. Due to the extraordinary amounts of explosive power required to sprint short distances, the calf muscles of short-distance runners tend to be large and bulky. Long-distance runners, on the other hand, tend to have slender, toned calf and leg muscles. While the added bulk may harm your speed over long distances, increasing the size of your calf muscles may help you to run faster over a shorter period of time. In line with these comparisons between long- and short-distance runners, the effects of running on the size of your calves vary. For people worried about the appearance of large calf muscles, long-distance, low-resistance cardiovascular exercise, such as jogging or brisk walking, may help to develop slim, toned calves. If, however, you wish to increase the size of your calves, sprinting, weightlifting and running uphill may help. While you may wish to shape your calves to suit your preferred running distance, focusing solely on toning or bulking your calves may be detrimental to your goals. As recommended by the Centers for Disease Control and Prevention, a healthy adult exercise program should combine muscle-strengthening and cardiovascular exercise. Similarly, your calf workouts should not focus exclusively on either bulking or toning exercises. 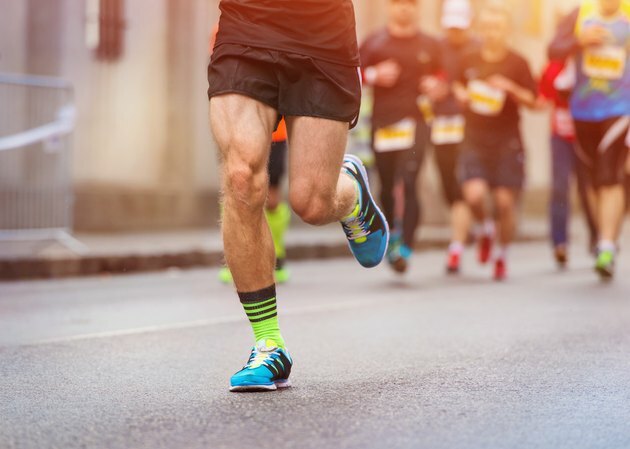 For distance runners, the added power provided by resistance exercises may help on uphill climbs and race-closing sprints, while the endurance provided by long-distance running may benefit sprinters who compete in multiple races over a short span of time. While larger, stronger calves may help you to run faster over short distances, the size of your calves does not determine your running speed. With a combination of muscle development, nutrition, technique and genetics coming into play, the size of your calves plays a minimal, though significant, role in helping you to run faster. As such, you should avoid focusing on a specific group of muscles in your attempts to run faster. By adding calf exercises to a complete diet and exercise program, however, you may be able to achieve your desired boost in running speed. Do You Get Leg Strength From Jogging?